Blogger has been devising new methods for tightly integrating it’s new Social Network with Blogger. 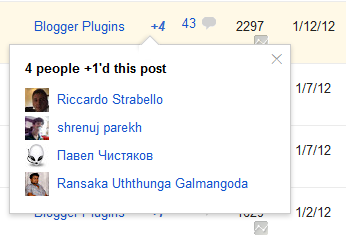 They have now released yet another Google Plus integration feature. If you are using the New Dashboard, you might have already noticed the change. Blogger has added a Plus one Counter(not the regular count button that you see on numerous web pages) to the Blogger dashboard, which gives the author some information about how the post is being received on the Social Network . It displays a count of how many times the post has been shared on G+ . If you click on the count it will show a list of users who have +1 ed your post. These Counts are available only in the New Interface. So if you haven’t made the switch yet, it might be a good time to make a move. This gives you a quick idea of the Social reaction to your Blog Posts.You can easily find out which posts of yours are most popular on Google +. Wow! This is a good news for those people who use Google Plus. Do you have instruction on how to use the Google Plus Site? Right now I haven't joined the social network. Can you tell me how good Google Plus is? Is it better than Facebook? Or are they just equal? 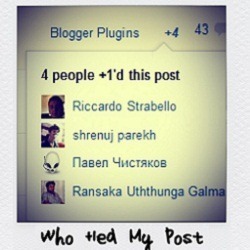 Just check out Once again nice feature added to Blogger. I don't see that in mine. Weird. Stats Professor, you're probably still using the old dashboard. Switch to the new and you'll see it.